ROBsessed Giveaway: A beloved author has published Me and Mom Fall for Spencer and it's here for Fiction Friday! So how do I feel right now about this particular giveaway? In fact, there will be no FanFiction Friday at the bottom of the post because it's all blended up in this goodness. The house next door to Sarah and her mother Marie has been vacant since the murder that happened there when Sarah was ten. Their neighbor, Frieda, was like a second mother to Sarah and she died brutally and the neighborhood never recovered. No one has lived in Frieda’s house for seventeen years. Imagine Sarah’s surprise when it finally sells to an on-line buyer. She looks through the thick growth separating her house from the other and a wild man looks back. He’s not exactly wild. He’s thirty-seven year old Spencer Gundry. Once he shaves the beard and gets a haircut, he’s not hard to look at. Well Sarah’s mom doesn’t think so, and neither does she. Problem is, Spencer has a few secrets of his own. I looooooved this leading male - Spencer. Oh my goodness. And this leading female - Sarah? She was hilarious. Laugh-out-loud funny. Her inner thoughts are a treasure. The lightness, sexiness and hilarity that unfolds in the beginning is a joy. When the story shifts gradually into serious and deeper issues, you find yourself completely committed to the healing and happiness of the characters. You've laughed, cried and swooned this whole time so that you long for Sarah to grab her piece of light in the darkness and never let go. It brings a smile to my face remembering this reading adventure and you won't be disappointed by this debut novel. My Wounded Soldier - SCREAMING! This one. I'd like this book optioned and Rob starring. TYVM. My Ex-Con - OMG. Could I love a ex-con more??? I think not. Not that I have experience loving ex-cons or anything. I just mean...oh you guys get what I mean. He's HOT and so loving and knows how to get down down down. Bringing Bella Home - I feel like this one is underrated compared to the period cousin, MWS, but BBH is wonderful. The strong, silent type never had meant so much. Love Like a Hurricane - What an excellent title because I felt like the love in this story was oh helluva twister, just like love can be. Whips your heart up into a mess and you can't see any way out of it but with that one person. I love when we go on serious adventures in counselor's stories and this is no exception. Roar Like a Lion - If you haven't noticed already, counselor doesn't just do exceptional (and unique) characterizations of Edward & Bella, she NAILS her supporting characters. Each story, they're all fantastic and this is another one that features a great bond between Edward & Jasper. Finding My Thunder - This story read the most personal to me. I felt deeply invested in Bella "finding her thunder". Maybe it's because of the tragic elements that make the story very emotional. Likely it's just counselor's skill to take her readers down the roads she paves and experiencing her characters lives so fully. Yeah that sounds about right. So those are the ones heading out! The other stories will remain and counselor is not leaving fandom. Of course she isn't. Not when we are still HIGHLY committed to Tonio! Did you cry on the last update of Deep in the Heart of Me? Because I sobbed like a baby. Pops and Tonio get me all verklempt. You only have to click a button, which you'll see when you enter. Tweeting the giveaway, following Diane on Twitter and visiting her Facebook page are optional but give you more chances to win! 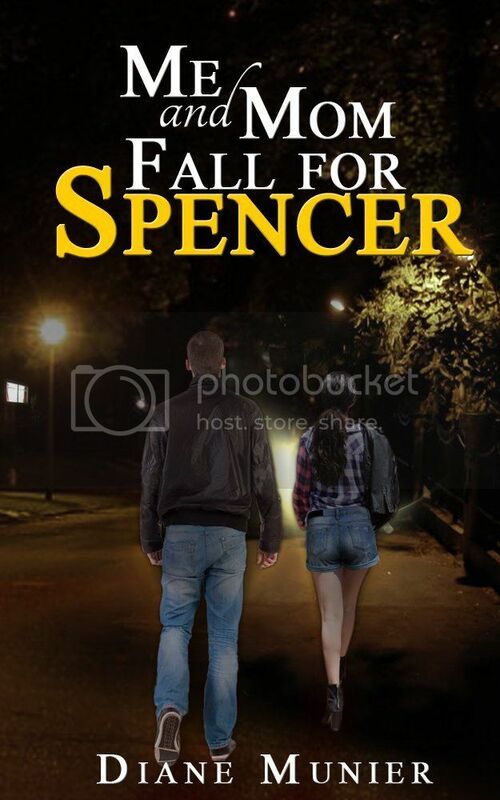 There will be 4 winners receiving an eBook (Kindle) of Me and Mom Fall for Spencer by Diane Munier! You can download Kindle apps for free. We can give winners instructions if needed.